CLARKSDALE, MISSISSIPPI'S JUKE JOINT FESTIVAL WEEKEND CALLED "BIGGEST LITTLE FESTIVAL IN THE SOUTH"
Below is a complete list of what's going on at the museum and we hope to see you out and about this weekend! Our hours of operation are Monday - Saturday, 9 a.m. - 5 p.m.
Friday, April 16th, 3 p.m. -- Join us in the DBM classroom for "Conversations With Honeyboy." At age 94, David "Honeyboy" Edwards is one of the last of the original Delta Blues masters, and is still playing and entertaining audiences around the world. Edwards will be selling and signing his CDs and book, The World Don't Owe Me Nothing. Friday, April 16th, 4 p.m. -- Join us in the DBM classroom to hear William Ferris discuss his new book and current exhibit at the museum, "Give My Poor Heart Ease." Give My Poor Heart Ease is a documentary record of Ferris's home state during the 1960s and '70s, illustrated with Ferris's photographs of Mississippi musicians and their communities and includes a CD of original music and a DVD of original film. The book, available in the DBM Shop, also features more than 20 interviews relating frank, dramatic and engaging first-person narratives about black life and blues music in the heart of the American South. Friday, April 16th, 5:30-7 p.m. -- Once again, the Delta Blues Museum Band will perform at the DBM Stage for the Care Station's annual Fish Fry fundraiser. The Care Station, located next to the museum, has been feeding Clarksdale's hungry for more than 20 years. For just $10, you get a plateful of catfish, hush puppies, fries, slaw and a dessert (eat in or take out). Tickets can be purchased in advance at the museum, as well as at the Care Station during the event. 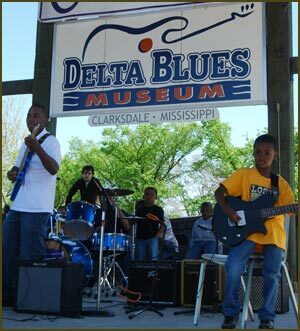 Saturday, April 17th -- Three years ago, Berklee College of Music began a summer scholarship initiative for students at the Delta Blues Museum, in Clarksdale, and the Robert Johnson Blues Museum, in Crystal Springs. To date, four recipients have made the trip to Berklee's Five-Week Summer Performance Program. The Berklee Mississippi Music Exchange, as the effort is now known, develops opportunities to exchange music, education and culture between Berklee, the Mississippi Delta and other parts of the state. On Saturday, the Berklee Mississippi Exchange Band performs at the Juke Joint Festival at 3:30 p.m. on the Delta Blues Museum Stage, and at 7:00 p.m. at Ground Zero Blues Club, opening for Rev. Peyton's Big Damn Band, and Super Chikan. 6 p.m.--Delta State University's "Ol' Skool Revue"
April 8, 2010 (Clarksdale, Mississippi) -- "I don't care what anybody says. There ain't another festival like it in the world," boasted Nan Hughes, one of Juke Joint Festival's key organizers. "Where else can you see Monkeys Riding Dogs one day and hang out in old-school juke joints the next? I think it's the biggest little festival in the South." The Juke Joint Festival itself is Saturday, April 17th in Clarksdale, Mississippi. Related events start Thursday and carry on through Sunday night. Last year's festival weekend drew fans from at least 43 U.S. states and 17 foreign countries. "We call it 'half blues festival, half small-town fair and all about the Delta' for a reason," explained co-organizer Goldie Hirsberg. "During the day we have activities for both visiting tourists and local families. At night, well, that's throw-down time! That's for the adults." Juke Joint Festival Weekend kicks off with a bang on Thursday night (April 15) when Grammy-winner Jimbo Mathus presents "Mosquitoville: Mississippi Songs & Stories" live on the Delta Cinema Stage (113 3rd St.). Sponsored by Clarksdale Revitalization, the presentation promises to delve into the Magnolia State's rich music and mythology. Doors open at 5pm with two free shows at 6pm and 7:30pm. Friday's festival-related activities include monkeys riding dogs from Pontotoc, Mississippi, as well as Coahoma County's latest Mississippi Blues Trail Marker dedication. The noon dedication at the WROX Museum (257 Delta Avenue) will recognize an early location of Clarksdale's famous WROX blues/gospel radio station. The event will be following by a William Ferris "Give My Poor Heart Ease" book signing and live blues revue at Cat Head Delta Blues & Folk Art across the street (252 Delta Avenue). From there, additional events travel down the street and include "Conversations with Honeyboy Edwards" at the Delta Blues Museum and a "Theo The Boogieman" performance at the Rock & Blues Museum. More live blues follows that night at the clubs and jukes. For many visiting tourists, it's the music that matters most, and Saturday will be a day for the history books. "We've got Mississippi blues musicians from 8 years young to 94 years old on Saturday," noted Roger Stolle, music coordinator and festival co-founder. "It's just a crazy list of real-deal legends. Big George Brock, Big Jack Johnson, Big T Williams. Super Chikan, Watermelon Slim, Duck Holmes. Cadillac John, Gearshifter, T-Model Ford. 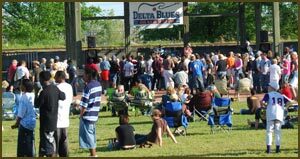 It may sound more like a wrestling show, grocery list or used car lot to some... but that's the Delta blues for you. Wild names and even wilder music!" Other notable blues musicians include Cedell Davis, Johnny Rawls, Stacy Mitchhart, Robert Belfour, Rev. Peyton's Big Damn Band, The Scissormen, Mr. Tater, Bilbo Walker, Cedric Burnside & Lightnin' Malcolm and many more. Among the performers are many of the stars of last year's Blues Music Award-winning film "M for Mississippi." The future of the blues will also be well-represented by student musicians and their instructors from the Delta Blues Museum, Berklee Mississippi Exchange, DSU's Ol' Skool Revue and Stax Music Academy. Saturday alone will feature eight official daytime stages and 16 nighttime juke joint venues. The festival's daytime music is free while the nighttime music can be had for the reasonable price of a $10 wristband. The wristband also gets attendees onto the four nighttime bus shuttles as well as a fifth shuttle that would have made Robert Johnson himself proud. "This year, our friends at C&J Railroad and Mississippi Delta Railroad are running an actual locomotive with passenger cars back and forth between downtown's historic Train Depot and Hopson Plantation on Saturday night," said Hughes. "The train will also run roundtrip excursions on Friday night and Saturday lunchtime, and most of the trips will feature blues performances on board. How cool is that?" Pre-sale wristbands for Saturday night's main event will be available in front of Cat Head Delta Blues & Folk Art (252 Delta Avenue) on Thursday and Friday afternoon (April 15-16) as well as at the main festival tent on Saturday and at the nighttime venues while quantities last. Other Juke Joint Festival-related activities on Saturday include a 5K/8K Run, Robinson's Racing Pigs, Mini Film Fest at Delta Cinema, "Passport to Downtown" contest, arts & crafts vendors, food vendors and special events inside downtown businesses and restaurants. Family-friendly activities include a petting zoo, rock wall, Segway course, Moonbounce, kiddie train, face painting, Strut-Your-Mutt contest, student art show and more. Saturday night's festival events kick off with the inaugural "Miss Sarah Award" presentation at Sarah's Kitchen (278 Sunflower Avenue), 7pm. Named after the late blues kitchen owner, Miss Sarah Moore, the new award will be presented to two individuals each year (one past/one present) who have made notable contributions towards blues music, Mississippi tourism and the city of Clarksdale. After the awards, blues godfather David "Honeyboy" Edwards will perform, starting off the nighttime juke joint crawl's 16 venues. "On Sunday, the festivities continue with the always free and fun Cat Head Mini Blues Fest as well as the annual Ground Zero Blues Club blues brunch," said Stolle. Hotel rooms are still available at the Isle of Capri in nearby Lula. In addition to running a Saturday bus shuttle from the Isle of Capri hotel to downtown Clarksdale, the hotel is offering a special event rate at 1-800-the-Isle (promo code "JUKE"). The hotel/casino is a sponsor of the festival. Go to www.jukejointfestival.com for more details on the Juke Joint Festival & Related Events, April 15-18, 2010. James "T-Model" Ford, Honeyboy Edwards, Rev. Peyton's Big Damn Band, Big George Brock, Bilbo Walker & more. BBQ for sale.